Neu4bauer: What is it with me and glasses? What is it with me and glasses? Life is magical, you just have to see it through the right pair of glasses. For those afflicted, it's useful to see myopia or hyperopia as an opportunity to accessorise, rather than as a disadvantage. And why shouldn't we? Specs have become the accessory du jour even for those who don't require them. 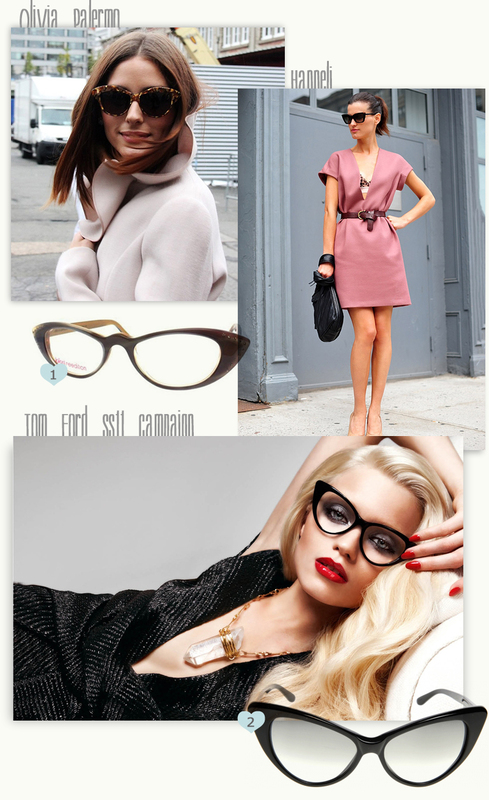 So regardless of whether you wear glasses by necessity or by choice, remember that an on-trend pair are the way to go. And retro glasses are definitely the way to go right now. If you want to make a strong statement, try a pair of cat-eye or harlequin glasses with diamond-shaped lenses that point sharply out. For an everyday pair pair that will last, keep low-key and subtle with a slight flare out at the edges. The new pair is such a cateye shape. It is vintage, bought during our Paris trip in April from a little optician near St.Paul (I am very sorry but I cannot find the receipt any more which is why I cannot tell you the exact address or name of the shop – only detail I want to spoil: very, very (very!) handsome optician – could be one of the reasons I made that very quick buy *hehe*). Für die Sehgeschädigten unter uns ist es schön, wie unsere Kurz- oder Weitsichtigkeit sich zum Vorteil toller Accessoires wandelt. Und warum sollten wir das nicht nutzen? Brillen haben sich zum accessoire du jour gewandelt, sogar für diejenigen unter uns, die sie nicht brauchen. Also, egal ob ihr Brillen aus Notwendigkeit oder mit Fensterglas tragt: ein On-Trend-Gestell ist in dieser Saison unabdingbar. Und Retro-Brillen sind definitiv der richtige Weg zur Zeit. Wenn ihr ein starkes Statement geben wollt, versucht ein Paar Katzenaugen- oder 'Harlekin'-Brillen mit diamantförmigen Gläsern, die an der Seite scharf nach außen zeigen. Für eine Alltagsbrille eignet sich vielleicht eher eine abgemilderte Variante mit einem leichten Winkel zu den Seiten hin. Die neue Brille ist eine solche katzenförmige Brille. Vintage, in Paris während unseres April-Trips bei einem ganz kleinen Optiker in der Nähe von St. Paul gekauft. Leider finde ich den Beleg nicht mehr, weshalb Namen des Optikers und genaue Adresse nicht mehr nachvollziehbar sind. Einzige Erinnerung: der Optiker sah wirklich sehr, sehr (sehr!) gut aus – vielleicht ein Grund für den schnell getätigten Kauf *hehe*!! Who can wear them? / Wer kann sie tragen? Generally speaking a cat eye frame with rounded-out edges will work wonders for a square face or diamond shaped face. A round face can benefit from sharper edges, or large frames that curve upwards subtly. All that said though, the rules are never hard and fast: the best option is always to try, try, try on pairs until you work out what's right for your face shape and hairstyle. Allgemein gilt, dass katzenaugenförmige Brillen brilliant bei quadratischen oder diamantförmigen Gesichtern aussehen. Ein rundes Gesicht sollte man eher durch schärfere Kanten definieren oder mit einem großen Gestell, welches leicht nach oben geschwungen ist. Nichtsdestotrotz gilt neben all den Regeln: die beste Option ist noch immer so viele Brillen wie möglich auszuprobieren und herauszufinden, was mit deiner Gesichtsform und deinem Haarschnitt am besten aussieht. How to wear them? / Wie trag ich sie? Get the right pair of 50s-inspired glasses or sunglasses and you'll find they can work with many an outfit, from the very modern to the utterly vintage. If you're going for a vintage inspired look, stick to anything from the '40s through to the '60s. 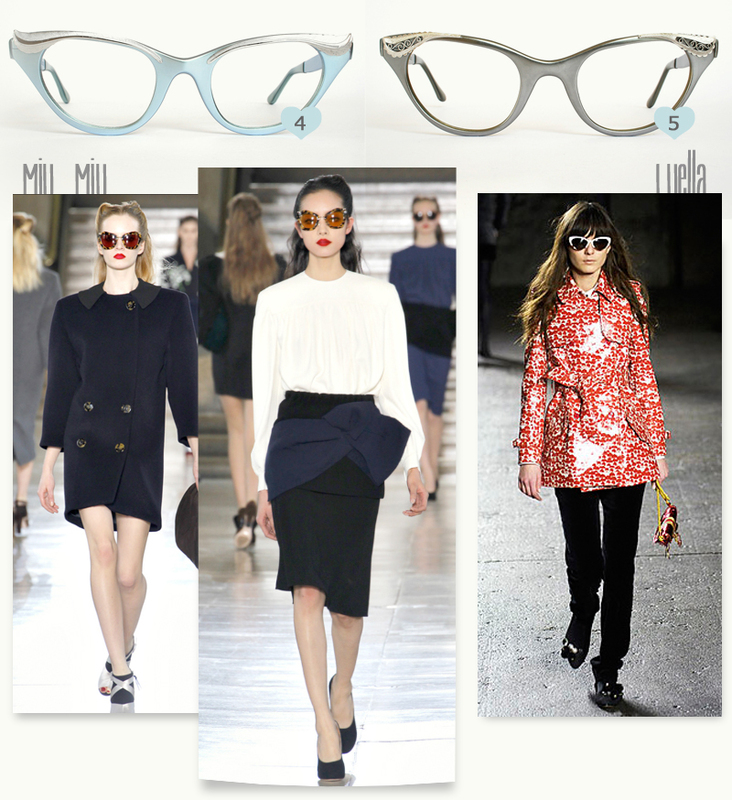 While '70s fashion is also seeing a major comeback, it's an era best suited to round frames. Zunächst mal die passende Brille oder Sonnenbrille im 50er-Jahre-Stil finden und dann werdet ihr erstaunt sein, denn man kann sie total vielseitig kombinieren – ob mit ultramodernen Schnitten oder im Retrostil. Solltet ihr euch für letzteres entscheiden, dann eher mit Modellen im Stile der 40er bis 60er-Jahren tragen. Die 70er erleben zwar zur Zeit auch ein erhebliches Comeback, aber diese Mode sieht besser mit runden Brillenformen aus! Mho: Nothing wrong with glasses whatever shape and color. The best versions I've found on my dentist (back in Germany) and he had troubles to do his job since laughing and opening the mouth for the dentist are a sure no-no. Further I saw some aaaaawesome ones - rainbow colored in zigzag pattern for 'brow-line' - worn by a nurse in a hospital once in the past (when 'those things' weren't a fashion accessory). Being questioned by nosy me she confessed it to be her 'on duty glasses' to cheer up patients and to ease the start of a communication. Worked a treat! How was this French sentence in 'die Farbe Ev's' Blog:" Chancun ..., ooops - not good with French - Everybody to his liking?" Btw. : First 'Lassagne' to my liking ;-) :-) since the original is at times too heavy for me. Open prawn one - with a lesser tomato contents (mixed with 2 parts light sour cream) - is more acceptable for my (strange) stomach; Pizza 'this way' isn't bad either! J'adore les lunettes Cat Eye!!! I have many pairs of glasses. Quality and fashion are most important for me. 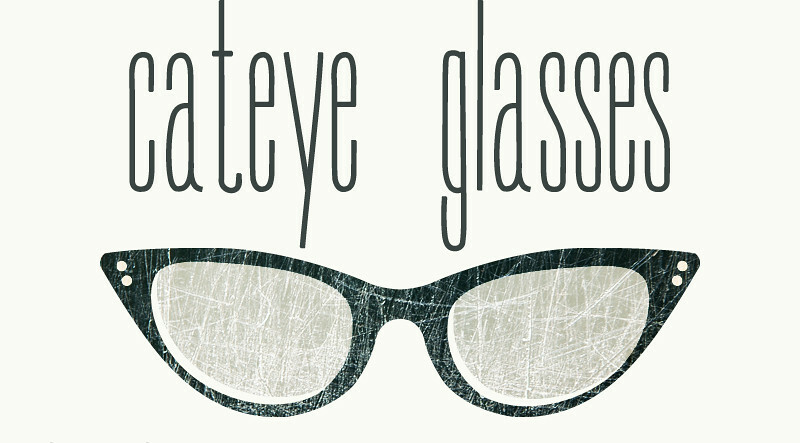 My favorite online glasses website is GlassesShop.com for their interesting and unique frame options.